50 min. Weston Woods. 2017. $59.95. ISBN 9781338162080. 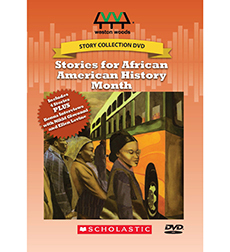 K-Gr 5—This story collection features four reissued titles: Nikki Giovanni's Rosa and Lincoln and Douglass: An American Friendship, Ellen Levine's Henry's Freedom Box: A True Story from the Underground Railroad, and Ntozake Shange's Ellington Was Not a Street. Each story features scanned illustrations from the picture book as well as complementary instrumental background music. Rosa also includes black-and-white photographs of Rosa Parks interspersed among the story's collage illustrations, and Lincoln and Douglass features photographs of abolitionists, including John Brown. Ellington Was Not a Street contains details about many famous African Americans, including musicians like Ray Barretto, Dizzy Gillespie, and Sonny Til; viewers hear snippets of their actual recordings in the background. The disc also features bonus interviews with Giovanni and Levine. In her segment, Giovanni describes some of the backstory behind Rosa and explains the symbolism in Bryan Collier's illustrations. Levine discusses the primary source documents she used and shares what happened to the real-life Henry "Box" Brown. Study guides for each story are also available online, so teachers will be able to easily weave these tales into their curriculum. VERDICT This is a top-shelf collection of stories featuring characters who display courage, integrity, dignity, and strength while facing life's challenges, and it should not be saved just for African American History Month.